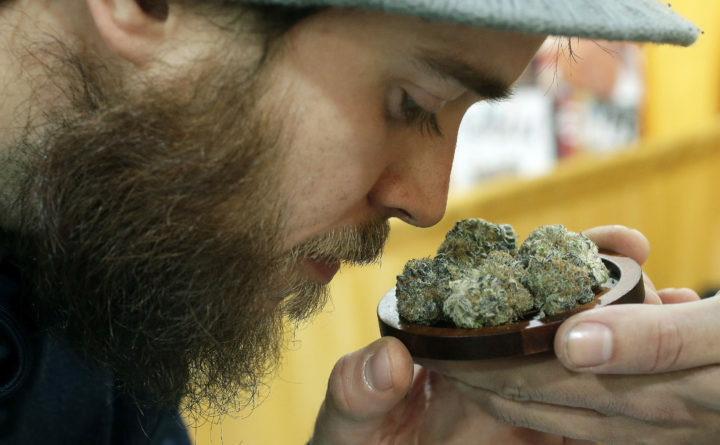 Julian Clark of Westerly, Rhode Islan, smells a strain of marijuana flowers called "Cookie Pebbles" at a trade show in Worcester, Massachusetts, Dec. 17, 2017. A recreational pot shop that has opened in Brookline is the first in the immediate Boston-area and the first within close proximity to MBTA stations. The store, located in a former bank building on Washington Street and Route 9, has been selling to medical marijuana patients but was recently licensed to sell to adult recreational users. It opened Saturday. Parking at the site is limited so customers were encouraged to take public transportation. The store is a short distance from stops on the MBTA’s Green Line. The Boston Globe reports at least 100 people gathered outside for the morning opening and there were no major traffic issues. It’s the 13th recreational pot shop to open in Massachusetts.